Giant's Toes are dropped by giants, although each giant provides only one toe. Any Fortify Health potion made using a giant's toe lasts for 300 seconds instead of 60. The potions are therefore 5.9 times more valuable than typical Fortify Health potions, making these the most valuable potions in the base game. Because of this, giant's toes are required to make all of the most expensive potions in the standard game. Two ingredients added with add-ons push Giant's Toe into third place for most expensive potions. Salmon Roe added by Hearthfire is by far the most profitable, with prices more than double what Giant's Toe can do, and Boar Tusk with Dragonborn being around 25% better. 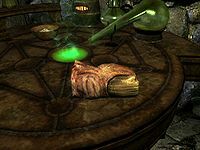 Giant's Toe can be combined a number of times with these two to make some of the more expensive potions (it is one of ten combinations for the ninth most expensive potion), but if you are looking to maximize skill gains or profits it is better to use other ingredients, as leveling is based on potion value. Giant's toes are dropped by all giants. During the quest A Night to Remember, you are asked to pick up a giant's toe (among other items). As a result, all giant's toes in your inventory will be marked as quest items until the end of the quest. This makes all your toes weightless, but they cannot be used or removed from your inventory. This page was last modified on 24 February 2019, at 01:07.